Everyone enjoy & love to have garma garam stuffed paratha for dinner or breakfast. 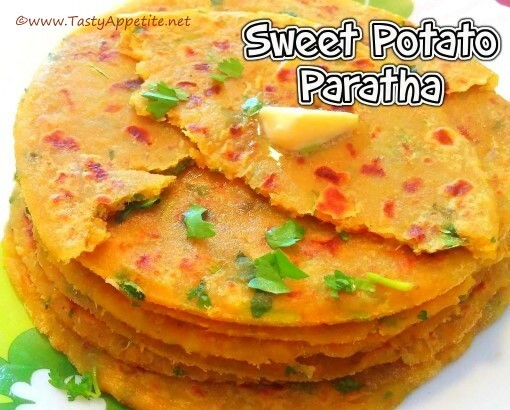 This delicious sweet potato paratha are a wonderful way to try with spices & flavors with mild sweet taste. This makes a stomach filling & palate satisfying stuffed paratha that is absolute quick to prepare. Kids love this healthy & nutritious paratha with the goodness of sweet potato for their lunch box. Lets see how to prepare with this easy video recipe. Wash and cook the sweet potato until soft & tender. Add it to mixing bowl and mash it to smooth mixture. Add salt, cumin pwd, hing, turmeric pwd, ghee, oil, coriander leaves and mix. Add little water and mash it to smooth mixture. Now add wheat flour and knead to soft dough. Take a ball and dust it with flour. Roll it to thick paratha. Place the paratha and cook in medium flame. Fry until the paratha is with golden brown spots on both sides. Soft & yummy sweet potato paratha is ready. Enjoy hot with yoghurt, raitha or any side dish of your choice.